Please note: During the summer, The Education Trust-Midwest will email monthly newsletters on the first Tuesday of each month. Our next newsletter will be on Tuesday, July 5. Weekly newsletters will resume on September 6. 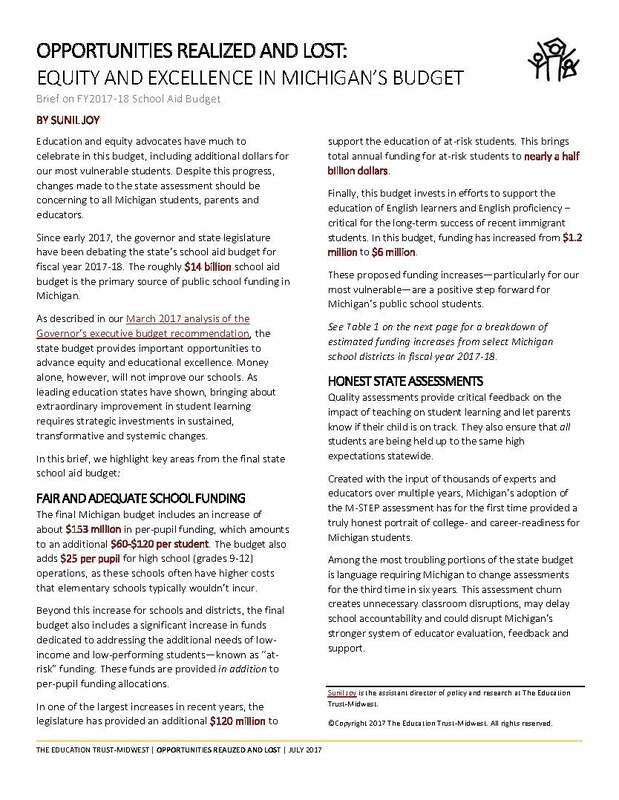 Last week, the Michigan Legislature adopted the fiscal year 2016-17 budget that gives Michigan the opportunity to advance strategies to improve student learning. As reported last week, the budget does not make changes to the current assessment system, invests nearly $25 million in additional funding to boost early literacy efforts and increases per pupil spend by $60-$120 per student. Now, the difficult work of collecting data to inform future investments, provide honest and transparent data to parents and teachers on student achievement and learn best practices from leading education states must begin. We thank Governor Snyder and legislative leaders, especially Representatives Tim Kelly and Senator Goeff Hansen, chairs of the House and Senate School Aid Appropriations Subcommittees, for their leadership. Last week, the Michigan legislature narrowly adopted a plan to address the debt of Detroit Public Schools. The plan maintains the current school district for the purpose of collecting taxes and paying down incurred debts, creates a new school district responsible for the education of students, and provides $617 million to the new district. The legislation also returns control of the schools to Detroit voters, following school board elections in November. While plans to improve accountability and coordination of schools in Detroit – proposed by the Coalition for the Future of Detroit Schoolchildren – were not include in the final legislation, this group of unlikely allies unquestionably changed the conversation about schools in Detroit and Michigan. Their work to highlight the need for robust accountability has improved public dialogue about Michigan’s public schools and will positively impact future efforts to better serve our students. Please click here for full Michigan Education Update.